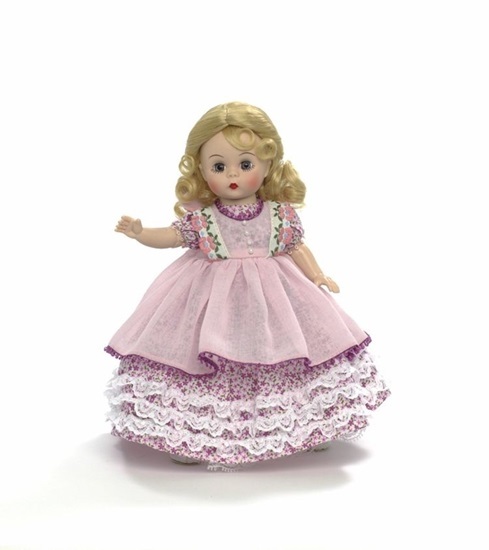 From The 2013 Little Women Collection by Madame Alexander, we are pleased to share "Bridesmaid Amy", a fully-articulated 8-inch Wendy with blue eyes and long, curly golden hair that is tied into a low ponytail in the back. Dressed for her sister's wedding she is wearing a Victorian style gown made from a pink and fuschia woven floral print. A full skirt comprised of three tiers of ruffles that are trimmed at the hem with pale pink picot, and the short puffed sleeves are detailed with a matching trim. A pink cotton apron, edged with purple picot around the neckline and hem, is worn over the dress. The bib of the apron is embellished by a floral trim and small bead "buttons". A white organdy and tulle petticoat, white cotton pantaloons, white stockings, and white leather, high button boots are the finishing touches for this bridesmaid. A paint palette accompanies this beautiful classic outfit. She is perfect for ages 14 and up.